did he behave like an ordinary, reasonable man? What is “safe enough” ? How much effort should we put into preventing misuse ? Should I fix this bug? What are we sharing back to the community? Reasonable Developer 1. Does not write code that’s clearly unethical; 2. Reports any unethical code; 3. Holds upper management responsible for accomplishing something unethical; 4. Is obligated to consider ethical implications of their code. What if you encounter ethical problems? What are the internal procedures? What are the alternative actions? Don’t just act reasonable. Act responsible. 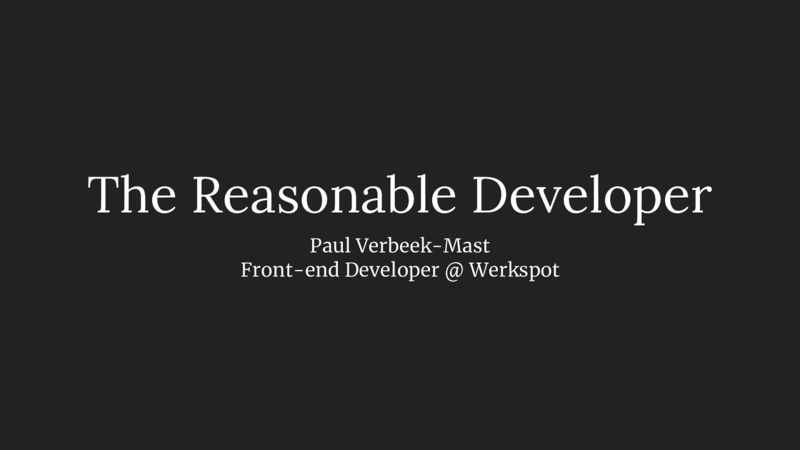 View The Reasonable Developer on Notist. In the early 1800’s, a Belgian astronomer came up with the definition of ‘L’homme moyen’, the average man. The studies he did on what he called ‘social physics’, the way the average person behaves, is still being used in legal trials today. They use it to determine whether someone’s action was reasonable. Today, they not only have The Average Man, but a whole ‘legal village’ with characters like ‘The Reasonable Hairdresser’. Each to determine if a specific type of person has acted in a “normal” way. This got me thinking. Now that we are making machines that have to make ethical decisions, like self-driving cars, when will the first legal case against a developer happen? They are going to have to define a ‘reasonable developer’ to determine if the decisions they made and the code they produced were reasonable at the time of writing the code. Who would this Reasonable Developer be?